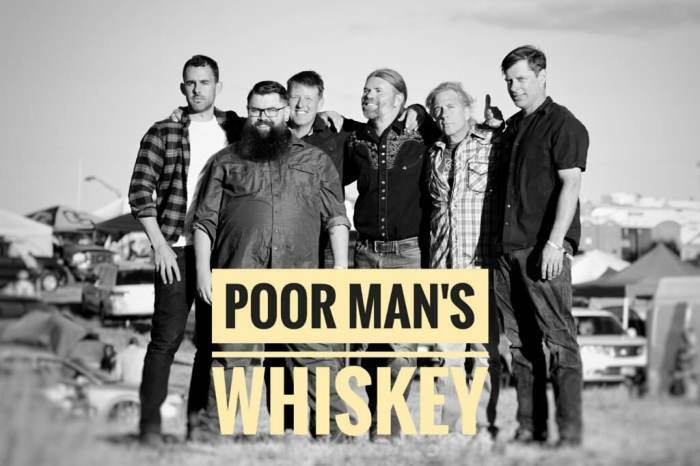 Poor Man's Whiskey is an American band originating in the San Francisco Bay Area rooted around the songwriting talents of Josh Brough and Jason Beard (whom met in 1993 at the University of California, Santa Barbara). Poor Man's Whiskey's live show and sound is blend of high octane old time/bluegrass music (often done on traditional acoustic instruments of banjo, guitar, and mandolin) and a more psychedelic blues/jam rock style that call upon their earlier influences such as Pink Floyd, The Allman Brothers Band, and the Grateful Dead. Poor Man's Whiskey seamlessly transitions between acoustic and electric styles with a carefully crafted commitment that revolves around well written songs and stories...while maintaining an exciting element of improvisation and the openness to let a song expand. Besides their seven original albums and high energy shows, Poor Man's Whiskey is also known for their special "interpretation sets". They gained international attention by their bluegrass rendition of "Dark Side of the Moonshine" (a bluegrass take on the classic Pink Floyd album), as well as successful interpretive sets of Paul Simon's "Graceland", The Allman Brothers Band, The Eagles, Old and In the Way, and Kate Wolf. These sets are are played in conjunction with an original set or a special festival late night party. "These guys have no boundaries. You're in the middle of a psychedelic Pink Floyd-like rock-n-roll song when someone picks up a banjo! Then they drop you into the middle of Paul Simon's Graceland, make a quick trip across the Irish countryside & drag you through a bit of folk & bluegrass. They're on the stage plugged in, off the stage unplugged amongst the crowd & everywhere in between. So much fun!"